Freshwater turtles are similar to sea turtles in that each species has particular foods that they eat. While some may actively hunt down fish to eat, others are happy on a diet of plants and small shelled animals. Like the sea turtle, the diet of a freshwater turtle will depend on their location. Some food sources are more available in certain regions, while others may be dependent on weather patterns or weather events. Many of the Australian freshwater turtles are omnivores, with a diet of both meat and vegetable matter, however there are a couple of species who are carnivores, and this carries through whether the freshwater turtles are wild or kept as pets. 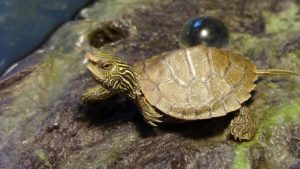 Below you’ll find a quick overview of some of the many Australian freshwater turtles and their diets. 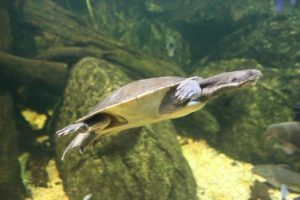 The eastern long neck turtle is a popular pet. They are carnivores, eating a diet of insects, worms, tadpoles, fish and frogs. If you have these turtles as pets, you’ll quickly realise they will quite happily swim past any vegetation on their way to a fish or insect. The saw-shell turtle is an omnivore as just as happy eating fruit that falls into the water, like berries, as they are having a meal of fish and shrimp. The broad shelled turtle is another carnivore with their diet made up mostly of shrimps, yabbies and fish. They have a similar diet to the long neck, but generally look for bigger prey than the long neck. The Murray River turtle is another added to the omnivore list. Their diet consists of water plants, algae and invertebrates. While they will happy munch down on worms or shrimp, they are just as happy eating water plants and underwater grasses. Also like sea turtles, freshwater turtles also have their place in maintaining a healthy waterways environment. They are happy to eat smaller introduced fish species as well as introduced plants which helps the native plants and wildlife grow. They do also have plenty of risks to their habitat. While freshwater turtles aren’t as susceptible to issues with plastic bags, one of their main threats is fishing line and hooks, both in use and laying around. Freshwater turtles will quite happily grab hold of your fishing line if they think they can eat what’s on the end of your hook, and it can take some time to get them to let go. If you find that there are turtles in the area you are fishing, your best bet may be to find somewhere else.